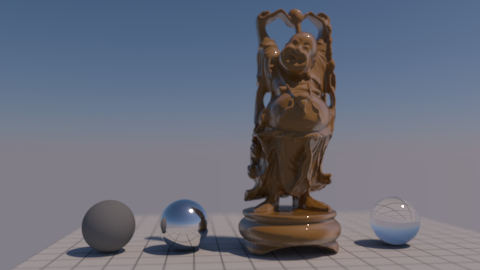 A Happy Buddha lit by a High Dynamic Range environment map. This is our standard environment light, a production-ready geometric area light supporting a full feature set. Specifies the exposure of the area light as a power of 2. Increasing the exposure by 1 will double the energy emitted by the light source. A value of 0 produces an intensity of 1 at the source. Environment map to be used for Image-Based Lighting (IBL) using a High Dynamic Range image (HDR). The environment map will be importance-sampled to define a ray distribution respecting the intensity distribution in the image. If the image contains small hot spots (pixel values above 1.0, like 100+) you will get intense illumination with sharp shadows. If the hot spots are large, the shadows will look blurry. If the image doesn't contain pixel values above 1.0 (Low Dynamic Range image or LDR), the illumination will look like colored ambient occlusion. Tint the environment color by this color. The resolution of the environment sphere is set by Procedural Resolution. It means, for example, that a 4096x2048 environment image will be re-sampled at 1024x512, if this is the selected Procedural Resolution value. The Procedural Color will be evaluated and then multiplied by the Environment Image (if defined). Shading Rate, Tint, Exposure, and Color Temperature will also be applied as usual. 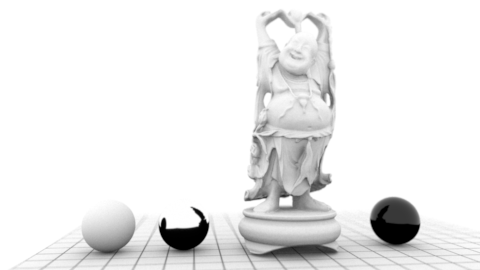 The resolution of the environment sphere will be defined by the Environment Image's resolution and the Shading Rate. This is controlling the resolution of the environment. If set to Automatic, the Environment Images' resolution will be used. If the Environment Image field is empty, a very low resolution will be used instead. Note: rman__ProceduralResolution is not a real shader parameter. It is tracked by RfM or RfK to be output in the RIB stream. That means that you will have to relaunch your IPR in Maya / Live Render in Katana to see the changes. This parameter allows you to use a node-based input for the environment map. Use this as an alternative to an explicit map input. This allows you to use a file node and manipulate the colors at runtime. The same scene, with a rmanDayLight node connected to Procedural Color. The procedural resolution is set to 2048x1024. No environment map and a white procedural color will give you the "Ambient Occlusion" look. Don't forget to set all surfaces to diffuse white and disable indirect illumination. Allow the user to choose the color temperature of the light in Kelvins. Unlike the basic light color, this allows the user to easily pick plausible light colors based on standard temperature measurements. Defaults to 6500K, which should be very close to white on most monitors (D65 illuminant). Scale the specular contribution of this light. Scale the diffuse contribution of this light. Light sampling is automatic, but you may occasionally have to override the allocated sample budgets to clean up noise in direct lighting. Override the automatic sample allocation and use a fixed number instead. Negative values disable this feature. Re-balance the automatic sample allocation. An importance of 2 will allocate twice the regular sample budget to this light. This method is often preferable to Fixed Sample Count, as it only biases the automatic estimates. You can connect portals, blockers and gobos here. Adaptively sample the lights shadows. Conservative mode will trace a larger percentage of the shadow rays, which will result in less acceleration, but potentially higher quality shadows. Aggressive will trace fewer rays, which can result in more significant speedups. Limits the shadow distance. Any value smaller or equal to 0.0 will be ignored and the shadow distance will be unlimited. Defaults to -1 : unlimited shadow distance. Can be used to optimize shadow rays in very large scenes but may introduce artefacts if set too short. Use a small value with a white environment light to achieve a short-range ambient-occlusion look. 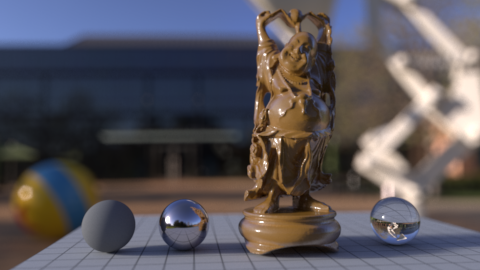 Ray tracing bias for shadow computations. -1 uses the automatically computed bias value. Set of geometry to consider for traced shadow intersection. Set of geometry to ignore for traced shadow intersection. Specify the group membership used for per-light AOVs. Note: __group is a special parameter directly used by the lighting services.